Tiger Tunes - Must You? When I went and spliced Matilda Jane. But very soon found out I was insane. Never on my own she lets me stray. Â“Must you have the missus with you? CanÂ’t you come out on your own? Must you always have a keeper? AinÂ’t you old enough to be alone? Why donÂ’t you take her out and lose her? Why be such a silly elf? I'm freezing and so weak for want of sleep." Now please be contented in the street. "Must you have a bed to sleep in? Can't you stand up in the corner for a nap? Have to sleep in every other lap. Don't you know that sleeping's all a habit? And I'll call a cop and run you in." Halfway through ACT III the Scarecrow and Tin Woodman are captured by King Pastoria's soldiers and imprisoned. While dangling through the prison bars the Tin Woodman strikes up a conversation with a passing Waitress whom he warns not to become a "must you." You can listen to Must You? by clicking on the record slip below. Listen to this 1903 recording! Must You? was a hit with audiences. It was recorded several times and was also offered as a Mira music box disc. A wonderful Zonophone recording by Dan W. Quinn can be heard on Vintage Recordings from the 1903 Wizard of Oz. 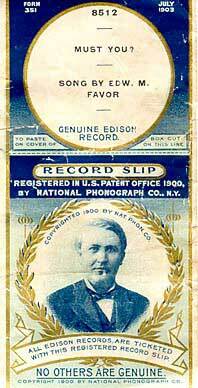 Offered here is a 1903 Edison cylinder recorded by Edward M. Favor. 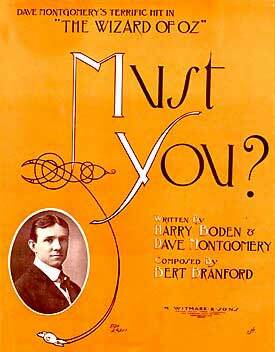 You can also print copies of the sheet music for yourself by clicking on the link below.